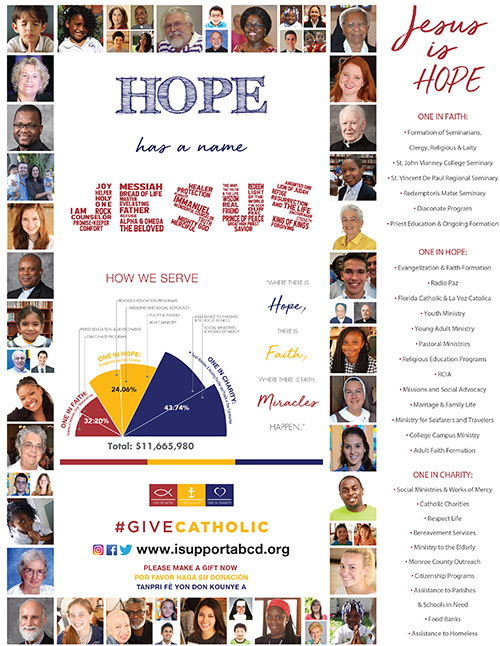 MIAMI | With the theme “Hope has a name – Jesus,” the annual archdiocesan campaign known as ABCD will kick off in parishes the weekend of Jan. 26-27. ABCD stands for Archbishop’s Charities and Development Appeal, and dates to the beginnings of the Diocese of Miami in 1958. The campaign funds most of the educational, pastoral and charitable activities of the Archdiocese of Miami. It is the one time a year that parishioners are asked to donate directly to the archdiocese, as opposed to their weekly offering to their parish. ABCD also asks parishioners to pledge an amount they can pay off during the year, as opposed to giving a one-time donation. “The ABCD, which supports our community through life-changing programs and ministries, is a way for us to put our faith into action,” Archbishop Thomas Wenski wrote in his 2019 letter to potential donors. In 2017, the last year for which final figures are available, the ABCD campaign raised $11,665,980 for archdiocesan ministries. A total of 26,627 donors – out of about 500,000 registered Catholics – contributed. The average gift was slightly over $500, according to Katie Blanco Bourdeau, chief development officer for the archdiocese. The ABCD brochure lists the ministries funded under the categories of faith, hope and charity. Under “One in faith” are listed: the formation of seminarians, clergy, religious and laity; support of the three seminaries where future archdiocesan priests study – St. John Vianney in Miami, St. Vincent de Paul in Boynton Beach and Redemptoris Mater in Hialeah; and the ongoing education and formation of priests and deacons. “One in faith” programs account for about 32 percent of the $11.7 million in ABCD-funded expenditures. Under “One in hope” are listed the archdiocesan departments of Evangelization and Faith Formation, Radio Paz, the Florida Catholic and La Voz Católica newspapers, Youth and Young Adult Ministry, College Campus Ministry, Pastoral Ministries, Religious Education, RCIA and Adult Faith Formation, Marriage and Family Life, Missions and Social Advocacy, and the Ministry for Seafarers and Travelers (at the seaports and airports). 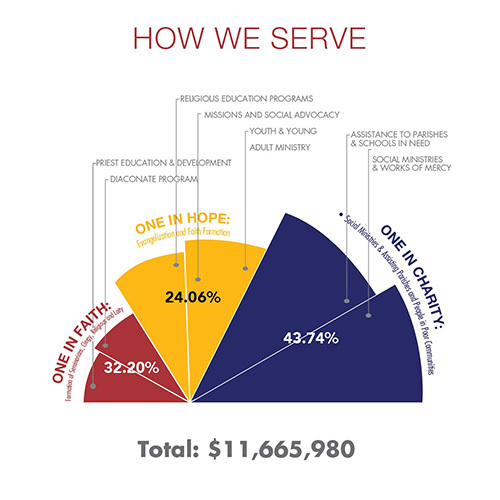 “One in hope” programs account for about 24 percent of the $11.7 million in ABCD-funded expenditures. Under “One in charity” are listed Catholic Charities, Respect Life, bereavement services, ministry to the elderly, outreach to Monroe County, citizenship programs, food banks, help for the homeless and assistance to parishes and schools in need. “One in charity” programs account for nearly 44 percent of the $11.7 million in ABCD-funded expenditures.